For other uses, see Global cooling (disambiguation). Mean temperature anomalies during the period 1965 to 1975 with respect to the average temperatures from 1937 to 1946. This dataset was not available at the time. Global cooling was a conjecture during the 1970s of imminent cooling of the Earth's surface and atmosphere culminating in a period of extensive glaciation. Press reports at the time did not accurately reflect the scientific literature. The current scientific opinion on climate change is that the Earth underwent global warming throughout the 20th century and continues to warm. By the 1970s, scientists were becoming increasingly aware that estimates of global temperatures showed cooling since 1945, as well as the possibility of large scale warming due to emissions of greenhouse gases. In the scientific papers which considered climate trends of the 21st century, less than 10% inclined towards future cooling, while most papers predicted future warming. The general public had little awareness of carbon dioxide's effects on climate, but Science News in May 1959 forecast a 25% increase in atmospheric carbon dioxide in the 150 years from 1850 to 2000, with a consequent warming trend. The actual increase in this period was 29%. Paul R. Ehrlich mentioned climate change from greenhouse gases in 1968. By the time the idea of global cooling reached the public press in the mid-1970s temperatures had stopped falling, and there was concern in the climatological community about carbon dioxide's warming effects. In response to such reports, the World Meteorological Organization issued a warning in June 1976 that "a very significant warming of global climate" was probable. Currently, there are some concerns about the possible regional cooling effects of a slowdown or shutdown of thermohaline circulation, which might be provoked by an increase of fresh water mixing into the North Atlantic due to glacial melting. The probability of this occurring is generally considered to be very low, and the IPCC notes, "even in models where the THC weakens, there is still a warming over Europe. For example, in all AOGCM integrations where the radiative forcing is increasing, the sign of the temperature change over north-west Europe is positive." The cooling period is reproduced by current (1999 on) global climate models (GCMs) that include the physical effects of sulfate aerosols, and there is now general agreement that aerosol effects were the dominant cause of the mid-20th century cooling. At the time there were two physical mechanisms that were most frequently advanced to cause cooling: aerosols and orbital forcing. Human activity — mostly as a by-product of fossil fuel combustion, partly by land use changes — increases the number of tiny particles (aerosols) in the atmosphere. These have a direct effect: they effectively increase the planetary albedo, thus cooling the planet by reducing the solar radiation reaching the surface; and an indirect effect: they affect the properties of clouds by acting as cloud condensation nuclei. In the early 1970s some speculated that this cooling effect might dominate over the warming effect of the CO2 release: see discussion of Rasool and Schneider (1971), below. As a result of observations and a switch to cleaner fuel burning, this no longer seems likely; current scientific work indicates that global warming is far more likely. Although the temperature drops foreseen by this mechanism have now been discarded in light of better theory and the observed warming, aerosols are thought to have contributed a cooling tendency (outweighed by increases in greenhouse gases) and also have contributed to "Global Dimming." CO2, temperature, and dust concentration measured by Petit et al. from Vostok ice core at Antarctica. Orbital forcing refers to the slow, cyclical changes in the tilt of Earth's axis and shape of its orbit. These cycles alter the total amount of sunlight reaching the Earth by a small amount and affect the timing and intensity of the seasons. This mechanism is thought to be responsible for the timing of the ice age cycles, and understanding of the mechanism was increasing rapidly in the mid-1970s. The paper of Hays, Imbrie and Shackleton "Variations in the Earth's Orbit: Pacemaker of the Ice Ages" qualified its predictions with the remark that "forecasts must be qualified in two ways. First, they apply only to the natural component of future climatic trends - and not to anthropogenic effects such as those due to the burning of fossil fuels. Second, they describe only the long-term trends, because they are linked to orbital variations with periods of 20,000 years and longer. Climatic oscillations at higher frequencies are not predicted... the results indicate that the long-term trend over the next 20,000 years is towards extensive Northern Hemisphere glaciation and cooler climate". The idea that ice ages cycles were predictable appears to have become conflated with the idea that another one was due "soon" - perhaps because much of this study was done by geologists, who are accustomed to dealing with very long time scales and use "soon" to refer to periods of thousands of years. A strict application of the Milankovitch theory does not allow the prediction of a "rapid" ice age onset (i.e., less than a century or two) since the fastest orbital period is about 20,000 years. Some creative ways around this were found, notably one championed by Nigel Calder under the name of "snowblitz", but these ideas did not gain wide acceptance. It is common to see it asserted that the length of the current interglacial temperature peak is similar to the length of the preceding interglacial peak (Sangamon/Eem), and from this conclude that we might be nearing the end of this warm period. This conclusion is mistaken. Firstly, because the lengths of previous interglacials were not particularly regular; see figure. Petit et al. note that "interglacials 5.5 and 9.3 are different from the Holocene, but similar to each other in duration, shape and amplitude. During each of these two events, there is a warm period of 4 kyr followed by a relatively rapid cooling". Secondly, future orbital variations will not closely resemble those of the past. In 1923, there was concern about a new ice age and Captain Donald Baxter MacMillan sailed toward the Arctic sponsored by the National Geographical Society to look for evidence of advancing glaciers. In 1926, a Berlin astronomer was predicting global cooling but that it was "ages away". Concerns that a new ice age was approaching was revived in the 1950s. During the Cold War, there were concerns by Harry Wexler that setting off atom bombs could be hastening a new ice age from a nuclear winter scenario. J. Murray Mitchell showed as early as 1963 a multidecadal cooling since about 1940. At a conference on climate change held in Boulder, Colorado in 1965, evidence supporting Milankovitch cycles triggered speculation on how the calculated small changes in sunlight might somehow trigger ice ages. In 1966, Cesare Emiliani predicted that "a new glaciation will begin within a few thousand years." In his 1968 book The Population Bomb, Paul R. Ehrlich wrote "The greenhouse effect is being enhanced now by the greatly increased level of carbon dioxide... [this] is being countered by low-level clouds generated by contrails, dust, and other contaminants... At the moment we cannot predict what the overall climatic results will be of our using the atmosphere as a garbage dump." The temperature record as seen in 1975; compare with the next figure. Concern peaked in the early 1970s, though "the possibility of anthropogenic warming dominated the peer-reviewed literature even then"  (a cooling period began in 1945, and two decades of a cooling trend suggested a trough had been reached after several decades of warming). This peaking concern is partially attributable to the fact much less was then known about world climate and causes of ice ages. Climate scientists were aware that predictions based on this trend were not possible - because the trend was poorly studied and not understood (for example see reference). Despite that, in the popular press the possibility of cooling was reported generally without the caveats present in the scientific reports, and "unusually severe winters in Asia and parts of North America in 1972 and 1973...pushed the issue into the public consciousness". In the 1970s, the compilation of records to produce hemispheric, or global, temperature records had just begun. Spencer R. Weart's history of The Discovery of Global Warming states that: While neither scientists nor the public could be sure in the 1970s whether the world was warming or cooling, people were increasingly inclined to believe that global climate was on the move, and in no small way. On January 11, 1970, the Washington Post reported that "Colder Winters Held Dawn of New Ice Age". In 1972, Emiliani warned "Man's activity may either precipitate this new ice age or lead to substantial or even total melting of the ice caps...". By 1972 a group of glacial-epoch experts at a conference agreed that "the natural end of our warm epoch is undoubtedly near"; but the volume of Quaternary Research reporting on the meeting said that "the basic conclusion to be drawn from the discussions in this section is that the knowledge necessary for understanding the mechanism of climate change is still lamentably inadequate". Unless there were impacts from future human activity, they thought that serious cooling "must be expected within the next few millennia or even centuries"; but many other scientists doubted these conclusions. In 1972, George Kukla and Robert Matthews, in a Science write-up of a conference, asked when and how the current interglacial would end; concluding that "Global cooling and related rapid changes of environment, substantially exceeding the fluctuations experienced by man in historical times, must be expected within the next few millennia or even centuries." The 1970 Study of Critical Environmental Problems  reported the possibility of warming from increased carbon dioxide, but no concerns about cooling, setting a lower bound on the beginning of interest in "global cooling". 2 levels. J. Murray Mitchell still viewed humans as "innocent bystanders" in the cooling from the 1940s to 1970, but in 1971 his calculations suggested that rising emissions could cause significant cooling after 2000, though he also argued that emissions could cause warming depending on circumstances. Calculations were too basic at this time to be trusted to give reliable results. particulate pollution such as smog, some of which remains suspended in the atmosphere in aerosol form for years. The paper suggested that the global warming due to greenhouse gases would tend to have less effect with greater densities, and while aerosol pollution could cause warming, it was likely that it would tend to have a cooling effect which increased with density. They concluded that "An increase by only a factor of 4 in global aerosol background concentration may be sufficient to reduce the surface temperature by as much as 3.5 ° K. If sustained over a period of several years, such a temperature decrease over the whole globe is believed to be sufficient to trigger an ice age." 2 warming dominates the surface temperature patterns soon after 1980." The National Science Board's Patterns and Perspectives in Environmental Science report of 1972 discussed the cyclical behavior of climate, and the understanding at the time that the planet was entering a phase of cooling after a warm period. "Judging from the record of the past interglacial ages, the present time of high temperatures should be drawing to an end, to be followed by a long period of considerably colder temperatures leading into the next glacial age some 20,000 years from now." But it also continued; "However, it is possible, or even likely, that human interference has already altered the environment so much that the climatic pattern of the near future will follow a different path." The Board's report of 1974, Science And The Challenges Ahead, continued on this theme. "During the last 20-30 years, world temperature has fallen, irregularly at first but more sharply over the last decade." Discussion of cyclic glacial periods does not feature in this report. Instead it is the role of humans that is central to the report's analysis. "The cause of the cooling trend is not known with certainty. But there is increasing concern that man himself may be implicated, not only in the recent cooling trend but also in the warming temperatures over the last century". The report did not conclude whether carbon dioxide in warming, or agricultural and industrial pollution in cooling, are factors in the recent climatic changes, noting; "Before such questions as these can be resolved, major advances must be made in understanding the chemistry and physics of the atmosphere and oceans, and in measuring and tracing particulates through the system." There also was a Report by the U.S. National Academy of Sciences (NAS) entitled, "Understanding Climate Change: A Program for Action". The report stated (p. 36) that, "The average surface air temperature in the northern hemisphere increased from the 1880's until about 1940 and has been decreasing thereafter." The report did not predict whether the 25-year cooling trend would continue. It stated (Forward, p. v) that, "we do not have a good quantitative understanding of our climate machine and what determines its course [so] it does not seem possible to predict climate," and (p. 2) "The climates of the earth have always been changing, and they will doubtless continue to do so in the future. How large these future changes will be, and where and how rapidly they will occur, we do not know." The Report's "program for action" was a call for creation of a new "National Climatic Research Program." It stated (p. 62), "If we are to react rationally to the inevitable climatic changes of the future, and if we are ever to predict their future course, whether they are natural or man-induced, a far greater understanding of these changes is required than we now possess. It is, moreover, important that this knowledge be acquired as soon as possible." For that reason, it stated, "the time has now come to initiate a broad and coordinated attack on the problem of climate and climatic change." An April 28, 1975 article in Newsweek magazine was titled "The Cooling World", it pointed to "ominous signs that the Earth's weather patterns have begun to change" and pointed to "a drop of half a degree [Fahrenheit] in average ground temperatures in the Northern Hemisphere between 1945 and 1968." The article stated "The evidence in support of these predictions [of global cooling] has now begun to accumulate so massively that meteorologists are hard-pressed to keep up with it." The Newsweek article did not state the cause of cooling; it stated that "what causes the onset of major and minor ice ages remains a mystery" and cited the NAS conclusion that "not only are the basic scientific questions largely unanswered, but in many cases we do not yet know enough to pose the key questions." The article mentioned the alternative solutions of "melting the Arctic ice cap by covering it with black soot or diverting Arctic rivers" but conceded these were not feasible. The Newsweek article concluded by criticizing government leaders: "But the scientists see few signs that government leaders anywhere are even prepared to take the simple measures of stockpiling food or of introducing the variables of climatic uncertainty into economic projections of future food supplies...The longer the planners (politicians) delay, the more difficult will they find it to cope with climatic change once the results become grim reality." The article emphasized sensational and largely unsourced consequences - "resulting famines could be catastrophic", "drought and desolation," "the most devastating outbreak of tornadoes ever recorded", "droughts, floods, extended dry spells, long freezes, delayed monsoons," "impossible for starving peoples to migrate," "the present decline has taken the planet about a sixth of the way toward the Ice Age." 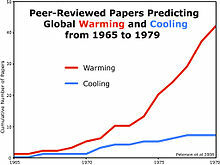 Academic analysis of the peer-reviewed studies published at that time shows that most papers examining aspects of climate during the 1970s were either neutral or showed a warming trend. Fig 8 shows [...] 1938 the warmest year. They [temperatures] have since fallen by about 0.4 °C. At the end there is a suggestion that the fall ceased in about 1964, and may even have reversed. Concerns about nuclear winter arose in the early 1980s from several reports. Similar speculations have appeared over effects due to catastrophes such as asteroid impacts and massive volcanic eruptions. In 1991, a prediction that massive oil well fires in Kuwait would cause significant effects on climate was incorrect. In January 1999, contrarian Patrick Michaels wrote a commentary offering to "take even money that the 10 years ending on December 31, 2007, will show a statistically significant global cooling trend in temperatures measured by satellite", on the basis of his view that record temperatures in 1998 had been a blip. Indeed, over that period, satellite-measured temperatures never again approached their 1998 peak. Due to a sharp but temporary dip in temperatures in 1999-2000, a least-squares linear regression fit to the satellite temperature record showed little overall trend. The RSS satellite temperature record showed a slight cooling trend, but the UAH satellite temperature record showed a slight warming trend. In 2003, the Office of Net Assessment at the United States Department of Defense was commissioned to produce a study on the likely and potential effects of abrupt modern climate change should a shutdown of thermohaline circulation occur. The study, conducted under ONA head Andrew Marshall, modelled its prospective climate change on the 8.2 kiloyear event, precisely because it was the middle alternative between the Younger Dryas and the Little Ice Age. Scientists acknowledge that "abrupt climate change initiated by Greenland ice sheet melting is not a realistic scenario for the 21st century". Currently, the concern that cooler temperatures would continue, and perhaps at a faster rate, has been observed to be incorrect by the IPCC. More has to be learned about climate, but the growing records have shown that the cooling concerns of 1975 have not been borne out. 2 will suspend the next glacial period for the next 500,000 years and will be the longest duration and intensity of the projected interglacial period and are longer than have been seen in the last 2.6 million years. As the NAS report indicates, scientific knowledge regarding climate change was more uncertain than it is today. At the time that Rasool and Schneider wrote their 1971 paper, climatologists had not yet recognized the significance of greenhouse gases other than water vapor and carbon dioxide, such as methane, nitrous oxide, and chlorofluorocarbons. Early in that decade, carbon dioxide was the only widely studied human-influenced greenhouse gas. The attention drawn to atmospheric gases in the 1970s stimulated many discoveries in subsequent decades. 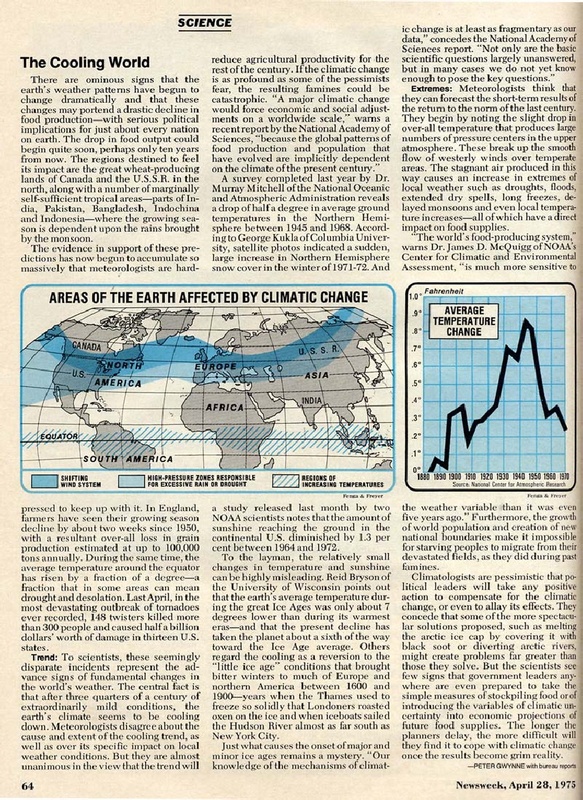 As the temperature pattern changed, global cooling was of waning interest by 1979. A common argument used to dismiss the significance of human caused climate change is to allege that scientists showed concerns about global cooling which did not materialise, and there is therefore no need to heed current scientific concerns about global warming. In a 1998 article promoting the Oregon Petition, Fred Singer argued that expert concerns about global warming should be dismissed on the basis that what he called "the same hysterical fears" had supposedly been expressed earlier about global cooling. Time magazine calls this argument the "ice age fallacy". Illustrating the argument, for several years an image has been circulated of a Time cover, supposedly dated 1977, showing a penguin above a cover story title "How to Survive the Coming Ice Age". In March 2013, The Mail on Sunday published an article by David Rose, showing this same cover image, to support his claim that there was as much concern in the 1970s about a "looming 'ice age'" as there was now about global warming. After researching the authenticity of the magazine cover image, in July 2013, Bryan Walsh, a senior editor at Time, confirmed that the image was a hoax, modified from a 2007 cover story image for "The Global Warming Survival Guide". ^ a b c d e Peterson, Thomas; Connolley, William; Fleck, John (September 2008). "The Myth of the 1970s Global Cooling Scientific Consensus" (PDF). Bulletin of the American Meteorological Society. 89 (9): 1325–1337. Bibcode:2008BAMS...89.1325P. doi:10.1175/2008BAMS2370.1. ^ "Summary for Policymakers" (PDF). Climate Change 2007: The Physical Science Basis. Contribution of Working Group I to the Fourth Assessment Report of the Intergovernmental Panel on Climate Change. Intergovernmental Panel on Climate Change. 2007-02-05. Archived (PDF) from the original on May 7, 2017. Retrieved May 7, 2017. ^ a b page 52 of The Population Bomb, 1968, available from "Paul Erhlich on climate change in 1968". Backseat driving. Retrieved November 17, 2005. ^ Schneider, Stephen H. (November 1972). "Atmospheric Particles and Climate: can we Evaluate the Impact of man's Activities?". Quaternary Research. 2 (3): 425–35. Bibcode:1972QuRes...2..425S. doi:10.1016/0033-5894(72)90068-3. ^ a b Intergovernmental Panel on Climate Change. "Climate Change 2001: The Scientific Basis". Archived from the original on March 5, 2016. Retrieved November 17, 2005. ^ Rasool, S.I. ; Schneider, S.H. (July 9, 1971). "Atmospheric Carbon Dioxide and Aerosols: Effects of Large Increases on Global Climate". Science. 173 (3992): 138–41. Bibcode:1971Sci...173..138R. doi:10.1126/science.173.3992.138. PMID 17739641. ^ Hays, J.D. ; Imbrie, John; Shackleton, N.J. (December 10, 1976). "Variations in the Earth's Orbit: Pacemaker of the Ice Ages". Science. 194 (4270): 1121–32. Bibcode:1976Sci...194.1121H. doi:10.1126/science.194.4270.1121. PMID 17790893. ^ Petit, Jean-Robert; et al. (June 3, 1999). "Climate and atmospheric history of the past 420,000 years from the Vostok ice core, Antarctica". Nature. 399 (6735): 429–36. Bibcode:1999Natur.399..429P. doi:10.1038/20859. ^ "Get Out the Ear Muffs. New Ice Age Forecast". The New York Times. November 11, 1956. Retrieved March 11, 2015. New findings of 'atomic timekeeping' suggest that North America may be heading into another major Ice Age, a Government geologist said today. ^ Mason, B. J. "QJRMS, 1976, p 473 (Symons Memorial Lecture)". Was an imminent Ice Age predicted in the '70s? No. Retrieved November 17, 2005. ^ Weart, Spencer. "The Modern Temperature Trend". The Discovery of Global Warming. Retrieved November 17, 2005. ^ "Colder Winters Held Dawn of New Ice Age". The Washington Post. January 11, 1970. Archived from the original on February 21, 2015. Retrieved March 11, 2015. Get a good grip on your long johns, cold weather haters -- the worst may be yet to come. That's the long-long-range weather forecast being given out by 'climatologists.' the people who study very long-term world weather trends. ^ Emiliani, Cesare (November 1972). "Quaternary hypsithermals". Quaternary Research. 2 (3): 270–3. Bibcode:1972QuRes...2..270E. doi:10.1016/0033-5894(72)90047-6. ^ Weart, Spencer. "Past Cycles: Ice Age Speculations". The Discovery of Global Warming. Retrieved November 17, 2005. ^ Kukla GJ, Matthews RK, Mitchell JM (November 1972). "Guest Editorial: The End of the Present Interglacial". Quaternary Research. 2 (3): 261–9. Bibcode:1972QuRes...2..261.. doi:10.1016/0033-5894(72)90046-4. ^ Kukla, G.J. ; Matthews, R.K. (1972). "When Will the Present Interglacial End?". Science. 178 (4057): 190–202. Bibcode:1972Sci...178..190K. doi:10.1126/science.178.4057.190. PMID 17789488. ^ Study of Critical Environmental Problems (SCEP) (October 1970). Man's Impact On The Global Environment: Assessment and Recommendations for Action. MIT Press. p. 319. ISBN 9780262690270. Retrieved February 3, 2016. ^ Weart, Spencer (2003–2011). "Aerosols: Volcanoes, Dust, Clouds and Climate – Warming or Cooling? (Early 1970s)". American Institute of Physics. Retrieved 6 February 2012. ^ Mitchell, J. Murray, Jr. (1971). "The Effect of Atmospheric Aerosols on Climate with Special Reference to Temperature near the Earth's Surface." J. Applied Meteorology 10: 703-14. ^ a b Weart, Spencer (2003–2011). "Aerosols: Volcanoes, Dust, Clouds and Climate". American Institute of Physics. Retrieved 6 February 2012. ^ Rasool, S. I.; Schneider, S. H. (1971). "Atmospheric Carbon Dioxide and Aerosols: Effects of Large Increases on Global Climate". Science. 173 (3992): 138–141. Bibcode:1971Sci...173..138R. doi:10.1126/science.173.3992.138. PMID 17739641. ^ Charlson, R. J.; Harrison, H.; Witt, G.; Rasool, S. I.; Schneider, S. H. (January 7, 1972). "Aerosol Concentrations: Effect on Planetary Temperatures". Science. 175 (4017): 95. Bibcode:1972Sci...175...95C. doi:10.1126/science.175.4017.95-a. ^ Weart, Spencer (2003–2011). "Aerosols: Volcanoes, Dust, Clouds and Climate: footnote 31". American Institute of Physics. Retrieved 6 February 2012. ^ Weart, Spencer (2003–2011). "Aerosols: Volcanoes, Dust, Clouds and Climate: Schneider part b". American Institute of Physics. Retrieved 6 February 2012. ^ a b Patterns and Perspectives in Environmental Science (Hardcover). Report of the National Science Board. Government Printing Office. 1972. p. 55. Retrieved July 15, 2008. ^ a b Science and the challenges ahead : report of the National Science Board. Report of the National Science Board. Government Printing Office. 1974. p. 24. Retrieved July 18, 2008. ^ Science and the challenges ahead : report of the National Science Board. Report of the National Science Board. Government Printing Office. 1974. p. 25. Retrieved July 18, 2008. ^ U. S. National Academy of Sciences (1975). Understanding Climate Change: A Program for Action. Washington : National Academy of Sciences. Retrieved January 6, 2014 – via Internet Archive. ^ "Science: Another Ice Age?". Time. June 24, 1974. ^ a b Gwynne, Peter (April 28, 1975). "The Cooling World". Newsweek. Archived from the original on June 25, 2018 – via Scribd. ^ Verger, Rob (May 23, 2014). "Newsweek Rewind: Debunking Global Cooling". Newsweek. Retrieved 2015-01-25. ^ Adler, Jerry (October 22, 2006). "Remember Global Cooling?". Newsweek. ^ Peterson, Thomas C.; Connolley, William M.; Fleck, John (September 1, 2008). "The Myth of the 1970s Global Cooling Scientific Consensus" (PDF). Bulletin of the American Meteorological Society. 89 (9): 1325–37. Bibcode:2008BAMS...89.1325P. doi:10.1175/2008BAMS2370.1. ^ Schneider, Stephen (December 29, 1977). "Against instant books" (PDF). Nature. 270 (22): 650. Bibcode:1977Natur.270..650S. doi:10.1038/270650a0. ^ Bastasch, Michael (February 19, 2014). "Flashback: Leonard Nimoy warned us of harsher weather". The Daily Caller. Retrieved April 19, 2014. ^ a b "World Climate Conference 1979". Was an imminent Ice Age predicted in the '70s? No. Retrieved November 17, 2005. ^ Michaels, Patrick J. (January 18, 1999). "Fighting Fire With Facts". Cato Institute. Retrieved July 19, 2013. ^ "RSS MSU lower trop. global mean". WoodForTrees. Archived from the original on 7 January 2014. Retrieved 6 January 2014. ^ "UAH NSSTC lower trop. global mean". WoodForTrees. Archived from the original on 7 January 2014. Retrieved 6 January 2014. ^ Schwartz, Peter; Randall, Doug (October 2003). "An Abrupt Climate Change Scenario and Its Implications for United States National Security" (PDF). Archived from the original (PDF) on March 20, 2009. ^ Jungclaus, Johann H.; et al. (2006). "Will Greenland melting halt the thermohaline circulation?". Geophysical Research Letters (published September 7, 2006). 33 (17): L17708. Bibcode:2006GeoRL..3317708J. doi:10.1029/2006GL026815. ^ Augustin, L.; Barbante, Carlo; Barnes, Piers R. F.; Marc Barnola, Jean; Bigler, Matthias; Castellano, Emiliano; Cattani, Olivier; Chappellaz, Jerome; et al. (June 10, 2004). 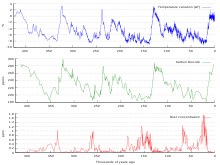 "Eight glacial cycles from an Antarctic ice core". Nature. 429 (6992): 623–8. Bibcode:2004Natur.429..623A. doi:10.1038/nature02599. PMID 15190344. ^ Berger, A.; Loutre, M. F. (August 23, 2002). "An Exceptionally Long Interglacial Ahead?". Science. 297 (5585): 1287–8. doi:10.1126/science.1076120. PMID 12193773. ^ Archer, David; Ganopolski, Andrey (May 5, 2005). "A Movable Trigger Fossil Fuel CO2 and the Onset Of The Next Glaciation". Geochemistry, Geophysics, Geosystems. 6 (5): Q05003. Bibcode:2005GGG.....6.5003A. doi:10.1029/2004GC000891. ^ Interglacial Working Group Of PAGES (November 20, 2015). "Interglacials Of The Last 800,000 years". Reviews of Geophysics. 54 (1): 162–219. Bibcode:2016RvGeo..54..162P. doi:10.1002/2015RG000482. hdl:2078.1/175429. ^ Weart, Spencer. "Other Greenhouse Gases". The Discovery of Global Warming. Retrieved November 17, 2005. ^ a b Walsh, Bryan (June 6, 2013). "TIME Magazine Cover Warning of Coming Ice Age Is a Fake". TIME.com. Retrieved July 16, 2013. ^ Singer, S. Fred (May 5, 1998). "Scientists add to heat over global warming". Archived from the original on November 19, 2005. Retrieved November 19, 2005. ^ "From Global Cooling to Global Cooling". The View From Mid-America. September 30, 2010. Retrieved July 16, 2013. ^ Rose, David (March 16, 2013). "The Great Green Con no. 1: The hard proof that finally shows global warming forecasts that are costing you billions were WRONG all along". London: Mail Online. Archived from the original on March 19, 2013. Retrieved July 16, 2013. In the Seventies, scientists and policymakers were just as concerned about a looming ‘ice age’ as they have been lately about global warming – as the Time magazine cover pictured here illustrates. Carslaw, K. S. "The Climate Record: The Last Several Centuries and Last Several Decades. Is the Climate Stable?". ENVI2150 Climate Change: Scientific Issues. Archived from the original on 2007-02-20. Retrieved November 17, 2005.
unknown. "History of Continental Drift - Before Wegener". Archived from the original on November 23, 2005. Retrieved November 17, 2005. SCOPE 13 - The Global Carbon Cycle, SCOPE, 1976. SCOPE 27 - Climate Impact Assessment, 1984. "Another Ice Age?". TIME. 24 June 1974. Chambers FM, Brain SA (2002). "Paradigm shifts in late-Holocene climatology?". The Holocene. 12 (2): 239–249. Bibcode:2002Holoc..12..239C. doi:10.1191/0959683602hl540fa.